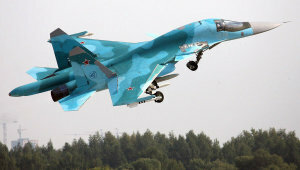 The need and outlook for new aircraft in Russia's air force are better defined today, Air Force Commander-in-Chief Col. Gen. Alexander Zelin said on Tuesday, the first day of the MAKS-2011 air show. The air show opened Tuesday and has a large program including the first T-50 demonstration flight. The T-50 is the 5th generation fighter developed under the program PAK FA (Future Aviation System for Tactical Air Force) at the Sukhoi OKB. T-50 prototypes will be delivered to the air force as early as 2013, according to Zelin, while mass production is scheduled for 2014-2015. Mikhail Pogosyan, president of United Aircraft Corporation, speaking at MAKS-2011 earlier, disclosed that two more 5th generation fighter prototypes would be ready before the end of 2011 to take part in tests being organized jointly with the Defense Ministry. T-50 development, meanwhile, continues, and everything suggests that the new fighter will be available for pilots to master and for final engineering touches within several years. But Russia's fighter development programs are sophisticated, and not everything is centered on the fifth-generation heavy fighter. Plans for the MiG-31 specialized air defense interceptors are simpler. These serious-looking aircraft are slated for a "big upgrade" under the MiG-31BM program, which will prolong the service life of the world's most powerful interceptor fighters. As for light tactical fighters, there is some uncertainty and the more this issue is debated by the military and the defense industry, the less the feeling that it is being taken seriously. The discussion concerns the upgrade of existing planes versus the development of new planes in the MiG-29 family. "We are not abandoning the MiG-35D project yet," Zelin commented briefly on the prospects for this family of planes. By way of explanation: The MiG-35 is the latest derivative of the 29. It was first shown in 2007. The aircraft is a so-called "4++ generation" plane: a half-step model incorporating some fifth-generation technology. The fighter is equipped with modern avionics, including an active phased-array radar unit, and can be fitted out with vectored-thrust engines. Russia has offered the MiG-35 to India at a large MMRCA (Medium Multi-Role Combat Aircraft) tender, where the Indian air force is planning to buy 126 aircraft. India plans to spend at least 10 billion dollars at this tender, which has come to be known as "the mother of all tenders" and has gained the status of potentially the biggest contract for combat aviation in the past two decades. But last April the MiG-35 was dropped from the MMRCA short list, and now Russia's Defense Ministry is the only hope for this fighter, which stands out in terms of cost among typical members of this class. The military, however, are not in a hurry to embrace the 35, as Zelin indicated in his cautiously worded statement. Later the general explained that the current priority for the Russian military is the T-50. "Russia, with its great expanses, needs precisely such an aircraft," he said, adding that light fighters like the F-35 are also required. In all probability this should mean that the air force is not against getting a fifth-generation light fighter in addition to the T-50, but is not quite sure where to look for it under the present circumstances. The military are not inclined to pay through the nose to upgrade existing MiG-29s. The Navy's missile carrier aircraft, or Tu-22M3 heavy supersonic bombers with Kh-22 missiles (and previously the Tu-16 workhorse), have remained operationally under joint strategic command (successors to the military districts that now include air bases and fleets), Zelin emphasized. This is a crucial point. In the Soviet era, naval missile-carrying aviation (MRAV) was one of the attack components of the Soviet Navy designed to engage the ship formations of a likely opponent. At the same time, it was a separate organization, "a state within the state." After the Soviet Union collapsed, naval aviation began to decline, surviving only on a limited basis while retiring surplus and once-formidable weapons that it seemly had no further need for. The gradual decline in combat potential led to a logical result: the Navy's missile carrier aircraft were subordinated to the air force as more budget money became available for a renewal of combat aviation closer to the second half of the 2000s. The current subordination to the joint strategic command will make it possible to use missile carriers in the Navy's interests, Zelin underscored. At the same time, he added, "fresh blood has been injected": mixed crews of "orthodox" and former "naval" flyers will take part in exercises scheduled for the near future in the Pacific Ocean.